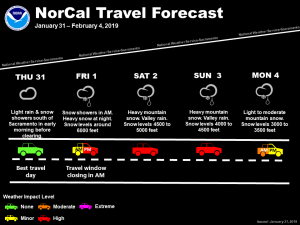 January 31, 2019 – Light precipitation possible south of Sacramento this morning. Light precipitation spreading across the forecast area Friday. 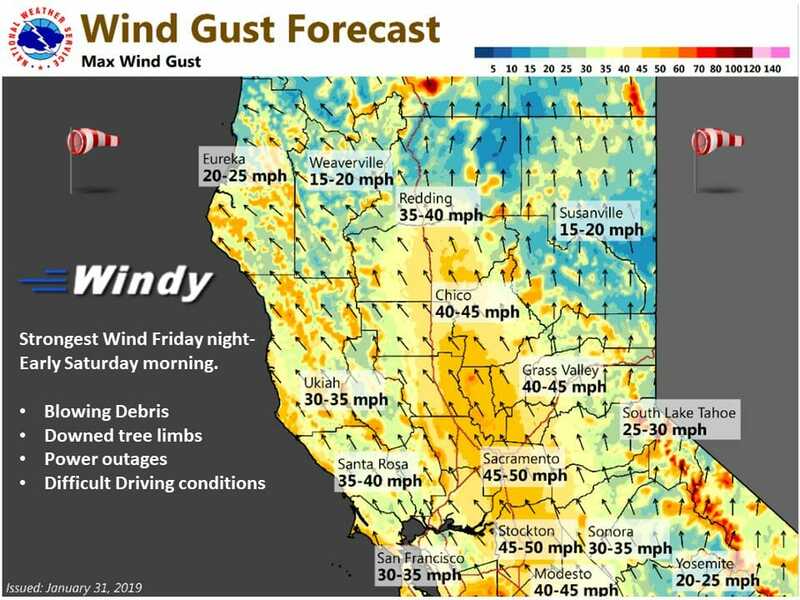 Heavy precipitation Friday night through the weekend with significant mountain snow and strong winds at times. Lower snow levels early next week. Central valley thunderstorms possible Saturday. Dry late Tuesday through the rest of the week. 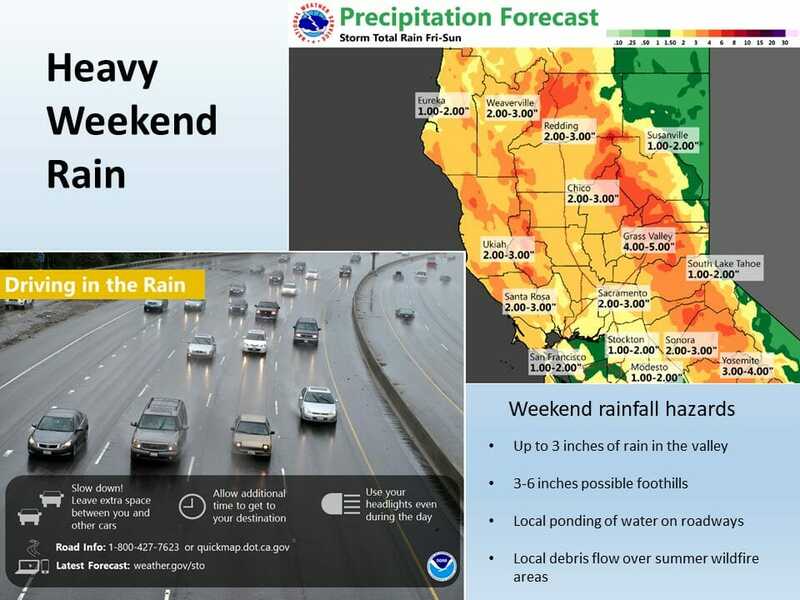 Upper level low pressure system now located off the central California coast bringing some scattered light showers to the southwest most forecast area this morning. Delta and northern San Joaquin valley may see a few sprinkles but this is about it for today. Some light fog has formed in the central valley again this morning but nothing too dense. This afternoon and evening look mainly dry before precipitation starts spreading over the forecast area late tonight and Friday morning. This initial precipitation Friday will be light as weak disturbances pivot out ahead of an approaching front. Even with light rain, cloud cover and cooling, daytime highs Friday will still come in around normal for this time of year. Models fairly consistent in bringing cold frontal band on to the coast Friday evening. GFS shows a PW plume feeding this front of over an inch and a quarter so this looks to be a fairly wet system and significant precipitation is expected. Current timing puts the front over the central valley by mid day Saturday. 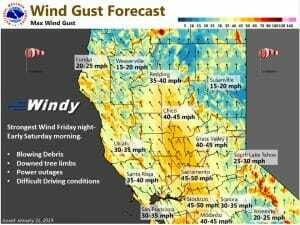 Strongest winds with this system will precede the front early Saturday morning. Nam shows 925 mb winds over the central valley topping 50 knots. Surface gradients are not ideal but it will still likely be quite gusty Friday night and early Saturday for at least a short period of time ahead of the frontal passage. 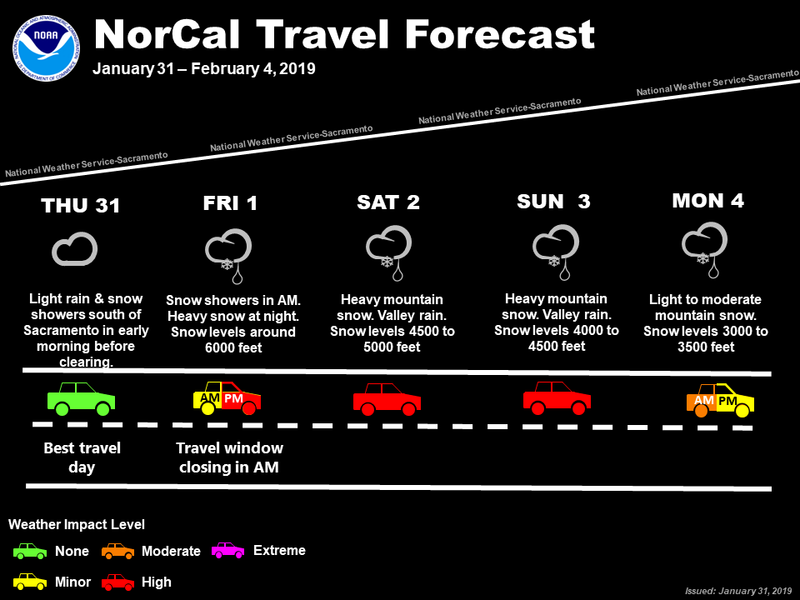 By 00z Sunday, models move main frontal band into the Sierra. 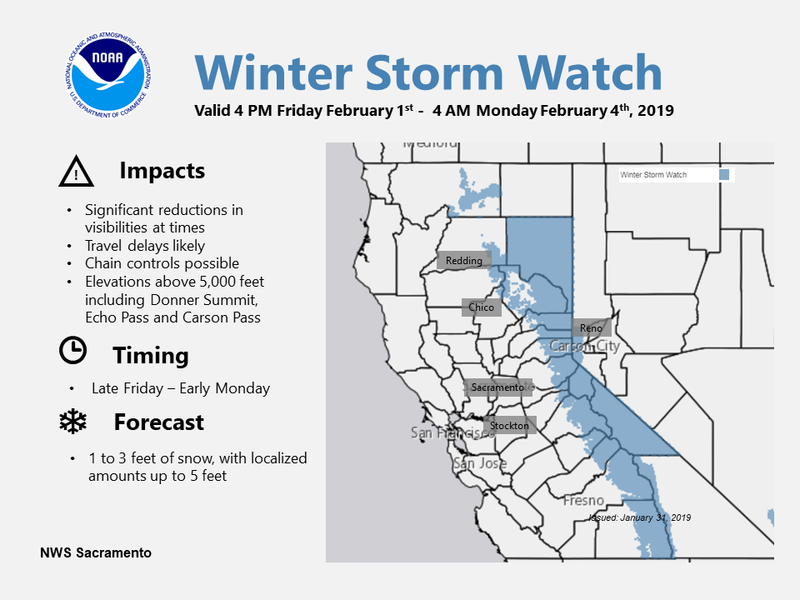 Heavy snow is indicated Friday night through Saturday so winter storm warning still on track especially when combined with expected strong winds. Upper trough still forecast to push into NorCal Saturday afternoon increasing instability. With main frontal ban over the Sierra 00z Sunday, may see a little clearing over the valley for surface instability and a chance of thunderstorms. With expected cloud cover, thunderstorms should stay fairly isolated. A secondary shortwave trough is forecast to swing across Norcal on Sunday bringing another wave of increased precipitation. Snow levels drop from 5000-6000 feet Saturday to as low as 4000 feet on Sunday as cold air filters in behind initial cold front. 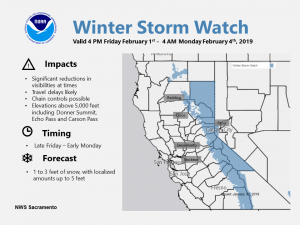 Winter storm warning stays in place through Sunday but lowering snow levels Sunday night into early next week may require new winter products for lower elevations. As the initial onslaught of shortwaves exit the region over the weekend, an anomalously cold upper trough swings through Monday afternoon. With an origin over far western British Columbia, it will transport frigid 850-500 mb temperatures into Northern California. More specifically, 700-mb temperatures are expected to drop down into the -15 to -18C range. Snow levels ultimately crash down toward the valley floor in many of the recent models. The biggest thing working against this system is a dearth of moisture given a frontal passage will have taken place earlier that morning. However, the upper forcing with the trough passage should spawn a broad axis of precipitation which exits the region Monday night/Tuesday morning. With snow levels across the more northern counties dropping down considerably, a dusting may be possible down to elevations around 1,500 feet. Once the system clears the region, continued cold advection will maintain below normal temperatures through midweek. On Monday and Tuesday, highs will generally sit in the upper 40s/low 50s across Valley locations, while the higher elevations remains in the 20s and 30s. Overnight temperatures will easily plummet to the freezing mark over the Valleys with single digits and teens likely in the mountains. A gradual warming trend is anticipated bringing temperatures closer to normal as mid/upper level ridging builds over the western U.S. Some break down of this ridge is possible by next Friday (Feb 8), but model uncertainty is rather high at this point.